Weight has always been a major issue whole my life. Some say it's hereditary, some say you don't carry weight and body type in heredity. Either ways, all my life has been focused on this one thing: weight. When I was little, about 9-10 years, I had practically no body weight; so that was a cause of worry for my parents. A little older, in school, I had a lot of weight and was fatter than the usual girls, and was made fun of. In college I worked hard to lose weight but could not be really consistent, so it was not a big problem though, but I had some inferiority about my weight as I still looked bigger than a lot of girls in my college. When I was working, I did a certification and became a yoga trainer in my mother's fitness center. I used to teach yoga and aerobics and exercises for 2.5 hours everyday, and as a result I lost a lot and went to my right weight and even though I was really fit and slim; maintaining that weight was another problem for me. After marriage, again I gained a lot of weight because all my food, weather and environment was changed and I was really not sure what to do. 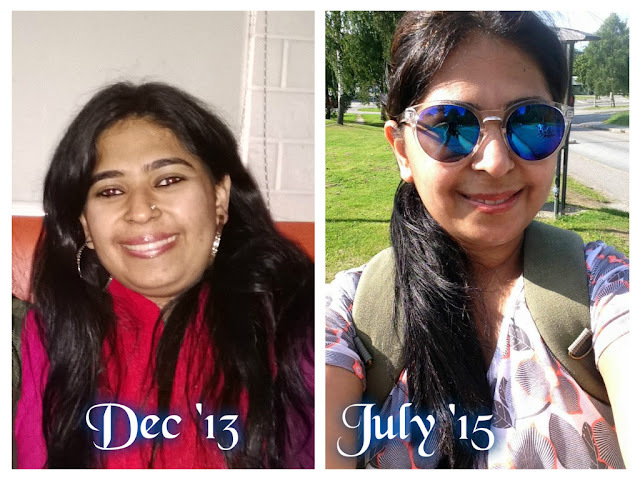 Then last year, with my mother's guidance (she's a naturopathic doctor and medical professional having her own hospital and treatment center in India) I began eating healthy and walking a lot. I even did some basic form of yoga and exercise in the beginning, but I soon gave up and could not stay really regular and consistent, I could not lose much weight, but yes, I feel fitter than past, and I have reduced in appearance, although not much on the scales, and now I really want to lose more weight. So, you see practically my life has been running around in circles with the word: weight. I secretly hope and wish someday I can get rid of this issue, but with time I have realized that there is no magic pill, no wand which can make me instantly slim and remain that way, unless I put in effort for the same, and keep doing so. I have known a lot of people who never have to worry about their weight, no matter what they eat, no matter how less or no exercise they do. Life is really unfair with people like me (and many, many others I know) whose lives are a constant battle between balancing, losing and maintaining their body weight, as if life was already not tough !! The sooner we stop whining and accept this fact that our bodies are made the way they are, and we have only the option of eating right and some for of exercise is a must, the quicker we can start focusing on what should we do to move in the right direction. I stopped three years ago and accepted my body the way it is. And you? Now, moving in the right direction needs guidance and inspiration. I am no doctor, I am no professional; but I have seen, done and experienced the results myself. Like it is said: Consistency is the key. When a particular plan to eat healthy or basic exercise form is adopted and followed religiously and regularly, no matter what, results can be seen. Also, bodies of men and women are totally different: how their bodies react against any food and work-outs are totally different. I am a woman and so I'm sharing this for fellow women. Here's my story which I hope can help some other people who are sailing in the same boat as me. If you want to follow some of this, please do so with caution and with the approval of your doctor if you are suffering from some kind of physical illness or disorder. When I moved to a new country after marriage, I gained a lot of weight and I became very fat. Almost all my dresses became a size (or two) too small and I began to look like a fat old woman, much more older than my age. Whole of the year 2013 I kept on going up and up, and finally realized the same when we clicked a lot of pictures during our India trip. At first I was really sad and disheartened and I thought I cannot go back to my previous shape ever. But then my husband inspired me to take it slow and easy and he motivated me to adopt to a regular diet plan. What was wrong in my diet was that I used to go hungry for long periods of time, did not eat breakfast most of the mornings and did not feel like cooking just for myself at lunch hours as hubby used to go to job and I used to feel alone and depressed. I did not eat any fruits and as a result, I filled up myself during dinner time because most of the times I used to be hungry for whole day. That along with lack of any form of exercise helped me gain a lot of weight and I began looking like that in the 2013 December picture. All of it surely took time and a lot, lot of patience and consistency. I did not feel any results showing up to first three months and then it needed more and more patience as I used to be tired and bored and did not feel like getting up at all the next day. It became increasingly difficult and then it felt like routine as I began to see little results and I kept on pushing myself, and I'm still on my way..
Because I did not make any big changes in my diet like having smoothies for breakfast, eating a lot of salads and having soup for dinner etc. etc. which so many diet plans suggest, I did not lose much weight. But that was not my first priority also, as I had begun looking so fat and heavy, I was looking much more older than my age and that's why I wanted to reduce my appearance and look nice and slim first of all. Here's how I reached here and I'm still on my way.. I was and have never been fond of eating at restaurants and outside home because there are no good Indian restaurants available where I live and I find most of the other foods inedible (because I'm a choosy person) and the others that I can manage to eat I find boring (like pizza, burgers or eating at McDonalds etc.). So the first thing is most of the times I cook and eat at home (it can be frozen or fresh, depending upon my schedule but it's home-cooked). We all know it's good and it's important to eat home made food, better so if it's fresh. But I have followed it for almost two years now and I have seen the results. The two main reasons I realized for my weight gain was a sedentary lifestyle and irregular eating habits. I gave one of them up as a beginning. I adopted regular eating habits. Breakfast. Lunch. Dinner. Same time (almost) everyday. No exceptions. I used to make fresh at home as I used to stay at home for the most part of the day. How it helped: my body got trained to feel hungry at the same time everyday (till today) which helps me to eat meals at fixed times each day and not feel hungry in between meals. Healthy snacking: I know it's difficult. Yes it was the most difficult part of the day for me as well. I used to have a little snacks between breakfast and lunch, and between lunch and dinner. I pushed myself to have healthy snacks each time when I was tempted to reach over to store bought unhealthy snacks. I began to eat grapes, oranges or even bananas for the mid-day snacks. (Yes, they are any day better than the unhealthy snacks). Also I do keep a handful of nuts in my bag and eat them as snacks as they provide energy. I did not starve myself, did not follow any diet plans, did not eat anything special, no use of so-called super foods, did not stop eating anything. I ate EVERYTHING. As long as it's made at home without any preservatives and added flavors, I did eat it. That's because I just can't starve myself. I need to eat; and sometimes I crave for some things and I've eaten them. I followed a particular eating pattern. The whole of 2015 I have mostly spent my whole weekdays out of the home. Some days I had leaves, some days I had half-days and other days I used to carry lunch box. I have divided the whole scheme like this: Breakfast: The days I go out early morning (7- 7:30 am); I eat one paratha and a glass of milk. (does not matter what time I come back). The days I go out late (after lunch) and the days I stay at home I eat a fruit (mostly an apple) and a glass of milk. Lunch: The days I go out for whole day, I take a lunch box with me. I always try not to eat from outside; it's expensive and can't be healthy as home made. I carry any variety of flavored rice with me in lunch. The days I leave after lunch, I eat at home: a simple dal/subzi and two chappatis. Same applies to the days I come home at lunch time. Dinner: The days I'm out for the whole day and come in the evening, I eat dal/subzi with two chappatis. The days I come back by lunch, I eat boiled daliya/veg daliya/a glass of milk for dinner (depends on how hungry I'm feeling). Also, it's always VEGETARIAN food I eat in the weekdays. That's my scheme and anybody can create a similar theme for themselves: it varies from person to person but the key point is just one: more activity, more tiredness, more food. And vice versa. Weekends food: I eat whatever I like. Yes, whatever I want. But again, home-made. And rice, oh my dear rice; I meet my lifeline, my dearest rice only on weekends. Then also, I mostly do not eat rice more than a bowl at once as well. Potion-control. That's really important. Sometimes we do go out and eat outside in the restaurants but I prefer to eat at home i.e leaving home after lunch and coming back at dinner time. It works out most of the times, but not every time. All the NON-VEGETARIAN food I cook in the weekends: chicken, fish, even egg curries. Caffeine: I don't have a huge intake of caffeine because I leave early around 7:30 am so it's basically a blessing I hardly get time to eat breakfast, let alone tea/coffee. I have a lone cup of tea in the evening and never more than one coffee at work per day. In the evening I try and prepare some quick and easy snacks: poha, instant dhokla, upma etc. with tea so it keeps me filled and I don't feel hungry at night. Water: drinking plenty of water if often suggested as an effective way to stay fit and we all know this, right? We all know how important it is to stay hydrated and drink a lot of water but I'll be totally honest and say I've been trying to drink more water but I need to increase. It really helps in the fitness process. Exercise: It's really important to get moving. But since I was having such a sedentary lifestyle in 2013, it was really difficult for me to suddenly start doing gym and difficult exercises. So I just took it easy, began walking twice a week, 20 minutes for the first quarter of 2014. Then I began to increase the days and time. By the end of 2014, I was walking about 4-5 days a week, up to 40 minutes. That's all I could manage, my feet hurt because of all the increased weight which was putting pressure, specially on my heels. I also felt more active. I increased my activeness level: i.e. not sitting in front of computer/T.V., doing household chores, using stairs instead of lifts/escalators etc. Also I began to increase the walking and by the end of 2015, I was walking every single day, about 80-90 minutes with very much increased speed, and without getting tired. I could also climb stairs without getting breathless. So, that's all I did. Yes, to sum up, just the home made food, less caffeine, totally making BREAKFAST the most important meal of the day, a fixed eating schedule (can't stress that enough), healthy snacking, leaving the sedentary lifestyle behind, not eating much at night (okay on weekdays), and walking, walking and only walking has given me these results. It took two full years, no less; and I'm still on my way as I have to lose the pounds on the scale. But yes, I must say I have achieved whatever I worked for. I did not get vigorous results for I did not do any vigorous activity, and I have accepted it. For my height, I know I look a little plump but it's okay and I know I will lose it. I am on my way and I will totally share my story when I do lose that weight too. This is my story and I might totally have skipped a lot of things because for me they have become a lifestyle, but there could be little things that could matter to someone who is in my shoes and looking for some inspiration. So, please feel free to ask me questions and I will answer with all my honesty. 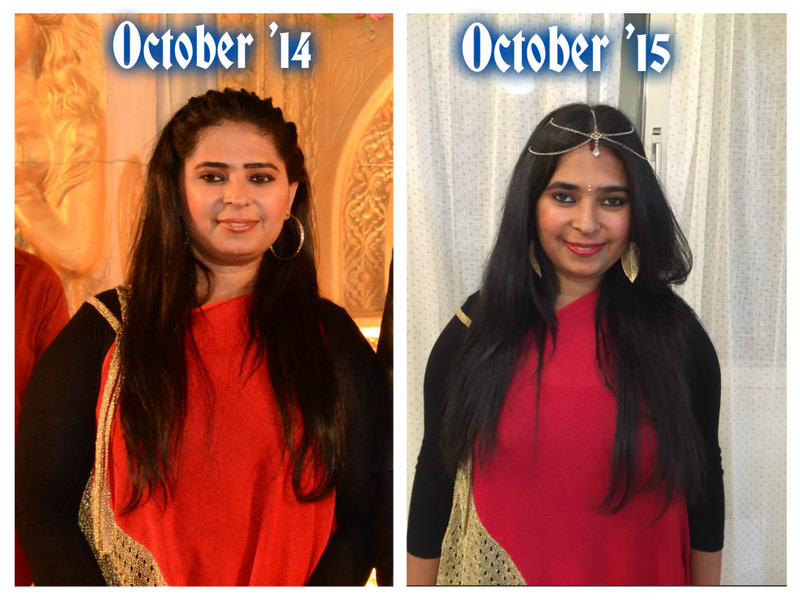 This is what I have achieved from October 2014 to October 2015 as well, and yes, that's the same dress. I have developed healthy cooking basically for myself and that has totally benefited me in so many ways: I have tried new, healthy options for food, I have kept boredom at bay with my cooking so that I don't have to eat out, I have saved money because I hardly eat out (I would rather carry my own lunch box and fruits and nuts). I have made my husband happy with so many new varieties in food. I have become active because I want to try so many new recipes. I keep on trying new recipes and sharing them. I am not saying all of those recipes are very healthy. A lot of them are totally healthy with low calories but I personally feel anything home-made is healthier than what we purchase from outside. So, for me, my cooking is healthy but kindly exercise discretion if trying out my recipes. You can connect with me on my cooking page where I share all kinds of recipes on Facebook. Brijdeep's Kitchen: For the love of food. Thank you for taking your time to read my story. If you liked my story or have any questions or comments, please leave your lovely comments/feedback in the comment section below. Very inspiring. You look great now. Totally agree. Home cooked food, portion control and moderate exercise and consistency is the key. Omg ... I m going through the same phase... Yes god was never kind to me on weight issue. I feel like i eat anything n i put on weight. But yes everybody has a different body type...i knew. And we hav the difficult ones. Well brijdeep i can totally relate to u..n have started doing something u did... Keeping patience ..thanks fr sharing your story. U look fab now. I am happy for you and your story inspired to me to start watching what I should eat. Thank you for sharing your story. Reached here from euphoric delights. I skip breakfasts and starve myself throughout the day. And I have gained a lot of weight. Your story has inspired me. Thank you. I will try your way. Hi Brijdeep, thanks for sharing your story and I also started doing the same what u shared (eating at right time and home made food). Its been 2 months and awaiting patiently to see good results. hello Brijdeep, Thanks for sharing your story. To tell you frankly, i am also sailing in the same boat as you were... The only word that haunt me is WEIGHT. And the things mentioned by you like not eating for long durations and sedentary lifestyle are my biggest villains as well. But after reading this i also feel that i can also do this. Thanks for making me realize this. And all the best to you too. Thanks for sharing ur story. Thanks for inspiring us. You showed us that just by doing the regular things instead of fad diets and exercises we can lose weight too. Only by being consistent and patient. Results will show. I am at that junture of life where i am trying something and as yet not seen any result but got to wait patiently for results to show up. Very inspiring! I have few questions, did u eat sweets or add sugar in your food or drinks? Also u said u ate rice once a week but u said u ate flavored rice for lunch? I had really no clue that it is possible to lose weight by eating Indian dishes and carbs like roti/ paratha evey day, I feel better reading your story. Thank you for sharing! Trampolines are great ways for the whole family to spend quality time outdoors. It provides good opportunities to carry out physical exercises for each of the member of the family without incurring physical injuries.